My mom is Filipino, but I grew up American. When I was little, I would say my favorite food was Thai (to my mom’s disappointment). I was thrilled to get to visit Thailand when I was 9 — I loved the golden temples, bright colors and exotic food. I always wanted to go back but never got the chance to. Today, most people are surprised to find out I train Muay Thai (kickboxing) almost every day. I don’t care for other martial arts, but Muay Thai fits me perfectly. I like the customs and traditions. Laugh all you want, but I love the colors and even the gloves. Most importantly, I like to kick and punch hard and feel like a superhero! “I like Kobe Bryant”, answers Renz. He explains that basketball is his favorite sport. The children at this little village love the iconic American and Japanese heroes, even though they are thousands of miles away. And even though some of their heroes are imaginary, they capture the children’s hearts and lift their spirits. This took me back to my childhood… Did you have a favorite childhood hero? 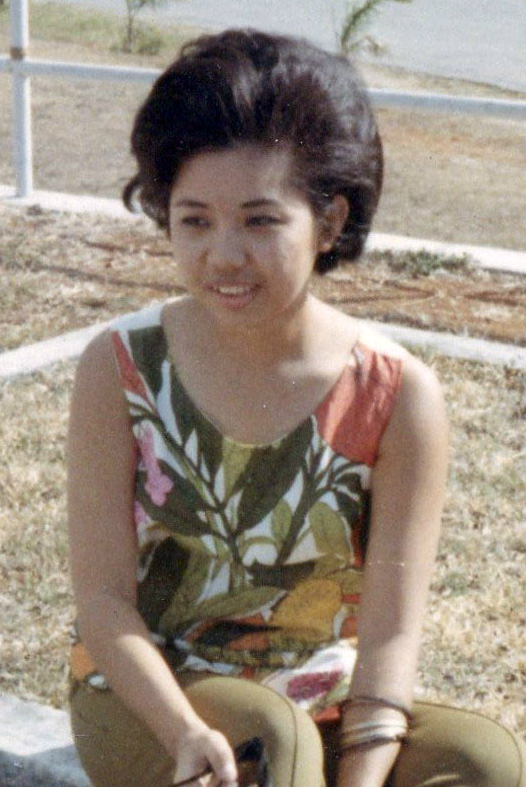 My mother’s name is Maria Milagros Cruz Rowencak, or just “mom.” Just like any relationship, it wasn’t always perfect. I loved her as much as any daughter can. But, I went through a quarter-life crisis where I felt many of my expectations fell apart. First, I gave up music and piano (my childhood passions). Then I worked two to three jobs, chasing after a dream I eventually decided was never going to happen. I developed personal issues — a lack of direction, resentment and disappointment. I would often take it out on her. But it wasn’t her fault. She could see I became cynical from living the rat race in a fast-paced city of ambitious people. Still, she gave me nothing but love. In 2007, she passed away suddenly… so suddenly that I didn’t really comprehend it. I was in denial for the first three months, but I would have moments when I would remember she was really gone. She was my support. She helped me make decisions. She encouraged me. Everything I am today is because of her. My independence, my intelligence and my love of travel. Most importantly, my capacity to love unconditionally. I got that all from her. When I lost all of that suddenly, I felt empty. I felt like I was in the air and I had no safety net. There were times when I would see a grandmother pushing her grandchild in a stroller and I would tear up knowing my mom would never see my children. And my children would never know what a great mother she was. After she died, I felt like I became an orphan. One evening during the summer of 2008, I was riding the New York subway and saw a little girl who was yawning and was cranky. So I gave her a piece of gum and made silly faces at her. She immediately forgot she was in a bad mood and was hungry. It was at that “Aha!” moment, when I decided to spend Christmas with children who didn’t have a family. I wanted to show children they had value, just like how my mother treated me. I remembered the children in Thailand. It is estimated that there are 30,000 to 40,000 prostitutes under 18 years of age. Thailand’s Health System Research Institute estimates children in prostitution make up 40% of all prostitutes in Thailand. My heart wanted to visit orphanages in Thailand but my gut said no. At that time, there was political turmoil in Bangkok. Booking a ticket 6 months in advance was too risky. I also didn’t want to spend two weeks with children who didn’t understand any English. I was frustrated. The very next day, I bought my plane ticket. Six months later, I arrived in the Philippines, not knowing where I was headed. Not long after, I found myself at a little orphanage in a province outside Manila, called Bethlehem House of Bread. I was surprised to see a lively and boisterous institution with smiling children in pressed uniforms. From an outsider’s perspective, the children look happy. They laugh, smile and play. But as I spent more time with each child, or an older girl one-on-one… I could feel the loneliness, sadness, and emptiness. There was a longing to have a family and to feel secure. One child, Kyla, became very attached to me. One day, I was to go to a house that was having a party for their children. She cried so hard that I begged the orphanage to let her come with me. I thought she deserved it. She deserved to be loved. At the house, Kyla danced in front of everyone. But she kept looking at me; looking for approval. I would cheer her on, yelling her name “Kyla! woo hoo!” I was her cheerleader. I wanted her to feel that she was important. I always held her. Every night, I would kiss her goodnight. One night, she was sleeping next to me and I cried so hard, knowing I would leave her and no one would kiss her good night. Another girl, who was 14 at the time, spent time with me one-on-one. She said to me “Ate (big sister), can I hug you?” I of course hugged her. When I left, she gave me a beautiful note saying, “For the first time in my life, I didn’t feel ugly around you.” Can you believe that? Every one seemed to have called her ugly. And I always told her she was beautiful. What was interesting was that most of the children couldn’t even understand me because I spoke English. But, they understood love. It’s a universal language. Kyla knew she could run to me for anything. Even if it was just a hug, I was hers. She sang to me even though she couldn’t hold a tune. I love her! I later discovered children swarming the streets of Manila. They were selling cigarettes, rags — anything to make a few pesos. Many of these orphaned children come from families of five to ten. They were sleeping in the streets, begging, snorting glue, eating scraps, walking around naked, and playing in filth. Life was not fair to them. They did not get to choose — they were brought into the world into terrible conditions, where the odds are against them. I saw many “bad” things that ignited my desire to help. But I didn’t get it at first. For example, I bought bikes for the children as a Christmas present. The problem is the children don’t need bikes. Things like bikes break, and bikes can’t be shared by 5 kids. Material things also don’t help a child survive. They need the love and support of a family. It’s not material things — they need food to survive today; and they need education and love to survive tomorrow. When I returned to New York, I committed to help a few orphanages that rescue children from the streets, and from extreme poverty and destitution. What I didn’t expect, was how generous people can be! I received so many donations that I needed to find more places that help orphan children. After research and a leap of faith, I traveled to Ukraine alone, in search of what would become the second country of Maya’s Hope’s Sponsorship Program. In September 2009, fate brought Sister Bernarda Arakatin into my life. She has the biggest heart in New York City! I helped her receive gifts to send to orphanages in Ukraine. This is something she’s been doing for more than 20 years. Eventually, she introduced me to more orphanages in Western Ukraine in 2010. Like an angel, she guided me through the rural and forgotten countryside of Ukraine. Then in 2011, three devoted, young volunteers joined me to help some orphans with mental and physical handicaps. We visited more orphanages in the Philippines and Ukraine, and with Sister Bernarda’s help, our efforts grew and many more care packages were shipped. One child in particular, 12-year-old Mary Jane, received a hearing aid for the first time in her life. This is thanks to Starkey Hearing Foundation’s collaboration with us. I founded Maya’s Hope with a mission to help desperate children in extreme poverty. We believe every child deserves a chance to have a good childhood, and to have a good life. Unfortunately, through no fault of their own, many children are brought into the world and forced to live in hunger, fear and loneliness. They are not guaranteed nutrition or education. If you asked these children what their hopes and dreams are, many of them will simply stare at you blankly. We started our sponsorship program to give people the opportunity to help these children; and to build a strong, nurturing relationship with each child. Unlike other organizations, we send 100% of each sponsor’s contribution directly to each child. We also do not treat children as numbers and names. We make a huge effort for each child, even if it is just to take pictures or make videos. In the Philippines, we currently have a scholarship for 38 children. In Ukraine, we have sponsorships for 5 babies and 2 Guardian Angels (caregivers) for orphan children with disabilities. A recent UNICEF report showed that every 2 seconds, an orphan dies from malnutrition. Each year, 14.5 million orphans never get adopted and age out of the system. 1 in 7 of these children commit suicide before age 18. 3 in 5 of the girls become prostitutes and 7 in 10 of the boys become criminals. These numbers are sometimes hard to grasp because they do not reveal the children behind the numbers. In terms of numbers, you and I are only 2 people out of 7 billion people in the world. But at this very moment, I’m writing directly to you. Thank you for caring about the children and reading this far. But forget about me for a few seconds. Instead, could you think back and remember: Was there one special person who made a big difference in your life? Because of my mom’s unconditional love, I am able to share that same love with the children I meet at orphanages. Imagine… you could do the same for someone else. For example, take a look at the pictures on the right. They are children whose lives someone like you changed forever, here at Maya’s Hope. When I was little, my mother always worried something awful would happen. So to comfort me, she told me she was Superwoman. She said that if anyone threatened to hurt me or her, it was impossible. Why? Because she was Superwoman and she could beat anybody up. Thankfully, she never beat anybody up. But, she did march into my school to meet with a teacher to contest a grade. She defended me from bullies at school. And, she always told me I was perfect and I could do anything I dreamed of. Unfortunately, Jonel’s heroes Batman and Naruto are fictional characters in an imaginary world. What the children need is real help from real people. The Lotus flower grows out of murky waters and mossy swamps, but blooms into a bright and beautiful flower, unstained and pure.Children in South Asia are 6.5 times more likely to die from protein-energy malnutrition than in the western hemisphere. Many of the children are also too poor to go to school.Your $1 a day will ensure that a child gets to go to school, and receives proper nutrition and basic medical care. Since we believe in helping the children succeed on their own through education, your child is required to maintain a good grade average to qualify. The fall of the Soviet Union left Ukraine as an independent nation grappling with economic instability (35% of the population lives below the poverty level). Giving birth to a child with Down syndrome-– or with any disability –-is financially and culturally crippling. Many consider it a curse. The children we serve in Ukraine are in institutions or come from poor homes. These children have physical and mental disabilities. Most of them were abandoned by their mothers at birth, and banished to a remote village where they are considered outcasts with no future in the society.Your $1 a day will help sponsor a “guardian angel”— a caregiver who serves as a mother and teacher —to the children in a “family living” environment. They will provide sick children with the care they need, and prepare the capable children for a life of adult autonomy. The orphanages we work with sometimes receive babies, as well as children with compromised gastrointestinal functions. These children need formula as their primary source of nutrition, and the orphanages often struggle financially to keep up with the demand. Your donation will rescue babies and help the orphanages pay for formula. This program was inspired by an angel in Kalinovka orphanage by the name of Margarita. When people ask me why I do this, I say, “Because they need me. And I need them.” Sometimes, I think about how each one of these children goes to sleep in an orphanage. Then I think about how some of them do not have someone to tell them they are beautiful, they’re perfect, and they have value in this world. Many of them may not get a hug and a kiss before falling asleep, and it breaks my heart. More urgently, in developing countries, malnutrition is associated with more than 50% of all deaths in children. While $1 can’t buy anything where we live anymore, it can be the difference between life or death for an impoverished child. After my mom passed away, I searched for a way to deal with the loss. By chance, this led me to the home countries of my parents (the Philippines and Ukraine). Ironically, traveling far away from home to visit those countries helped me understand my parents better. I find much comfort in being able to help the children, and it’s a way for me to say thank you to my mother. But as tough as it was for me to lose my mom, I cannot even imagine the emptiness it must feel for a young child to be abandoned and alone. I want to believe that each one of these children is brought into my life for a reason. I want to give them hope for a brighter future, whether it is through proper nutrition, education, encouragement, or just a big hug.